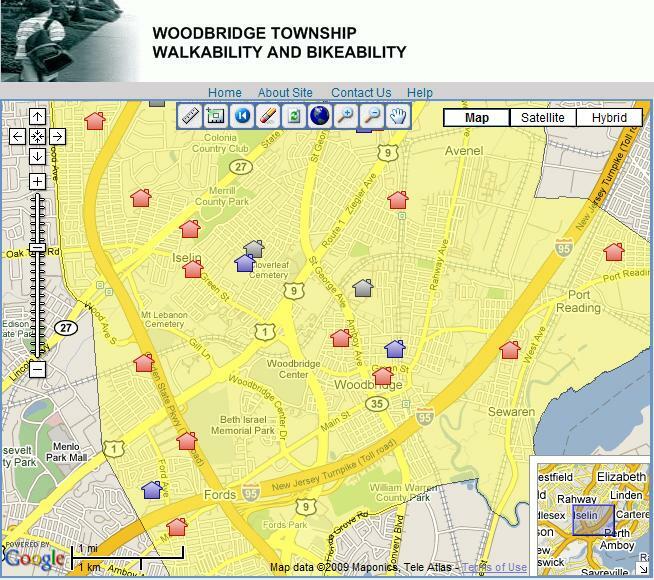 This map represents all the work put in by the volunteers at the May 30th Walkability Audit for Woodbridge Township Schools!! The Map shows how each area was accessed in terms of proper crosswalks, sidewalks, and traffic regulations! Check out your area to see if it is safe for walkers or needs improvements!! 10:30 am – 11:00 am: Return to school with your field survey results, and fill out post survey. 1. 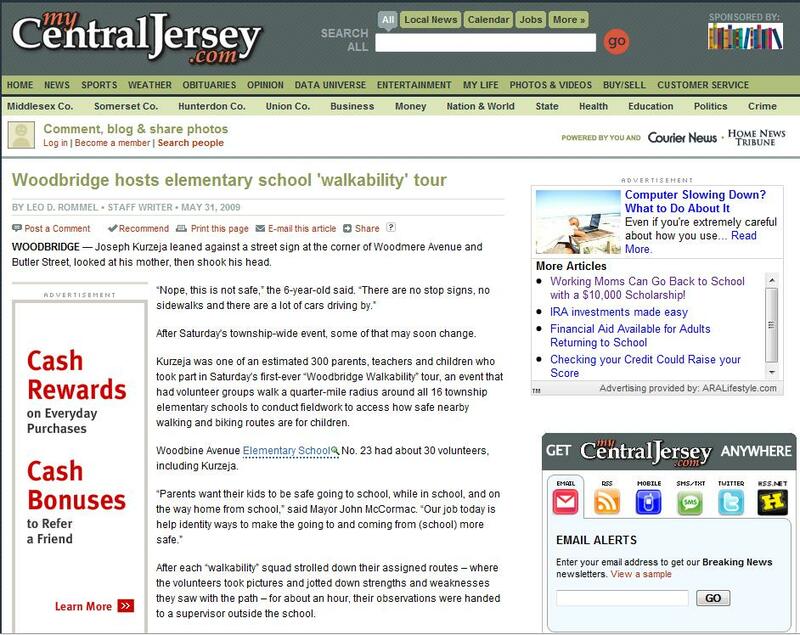 Arrive at your local elementary school by 9:00 am to receive materials for the walkability audit. Bring a digital camera if you have one! Coordinators will be at each school to explain how to conduct the community mapping survey. 2. Parents will fill out a pre-survey and sign a photo release form so that any pictures taken throughout the day can be used to promote future walkability audits. 3. Parents and students will follow the maps to their designated area. The big map will show the zoomed in area you will be walking through and the small map in the upper left corner will show that area in relation to the school. 4. Once you are assigned the area you will be assessing you can begin to make observations. The area will have points that have already been defined for you. These points will either be a pedestrian sign or a circle with an X through it. The pedestrian sign refers to the sidewalk. Although it is just one point on the sidewalk, we are really interested in the stretch of sidewalk. Walk up and down the sidewalk to make observations and record them. The circle with the X through it refers to the intersection, use the codes provided to assess the intersection. 5. For your convenience, the points on the map are numbered. The numbers were assigned as a suggested route but are by no means a required route. If a different route seems to make more sense you are encouraged to take it. Just make sure that when you are filling in the form you write the correct number for the location. Also, if there is a point on the map that seems unsafe DO NOT assess it. Our top priority is safety; we do not want to compromise your safety. Also, if there is a point located on someone’s private property, you do not need to assess that point. 6. When you arrive at the first point, use the codes located at the bottom of the first page or the top of the second page. Depending on the point (crosswalk or intersection) list the appropriate observation variables. For example, if you are observing the sidewalk, you should assess the sidewalk, comfort, traffic, and driver conditions that are applicable. If you are observing an intersection, you should assess all the crossing, traffic, and driver conditions that are applicable. 7. While making observations use the team’s digital camera to take photos of those observations. Record each photo on the observation form. Label each photo with sequential numbering beginning with 1 (i.e. photo 1, 2, 3, 4…). To identify photos easily please take pictures of street signs/names whenever you move to a different location. 8. When you arrive at the school be sure to document the steps/miles you have walked on the bottom of your survey form based on your pedometer data. We would like to acknowledge the participant names on the website. Please write down how you would like your name viewed (e.g. 1. Wendy Smith 2. W. Smith 3. Woodbridge resident). 9. Coordinators will upload your pictures to their laptops when you return to the school. You will be asked to fill out a short post survey. The assessment is now complete! As this weekend’s walkability audit is rapidly approaching, we encourage you to view the event materials located in the right-hand side menu. 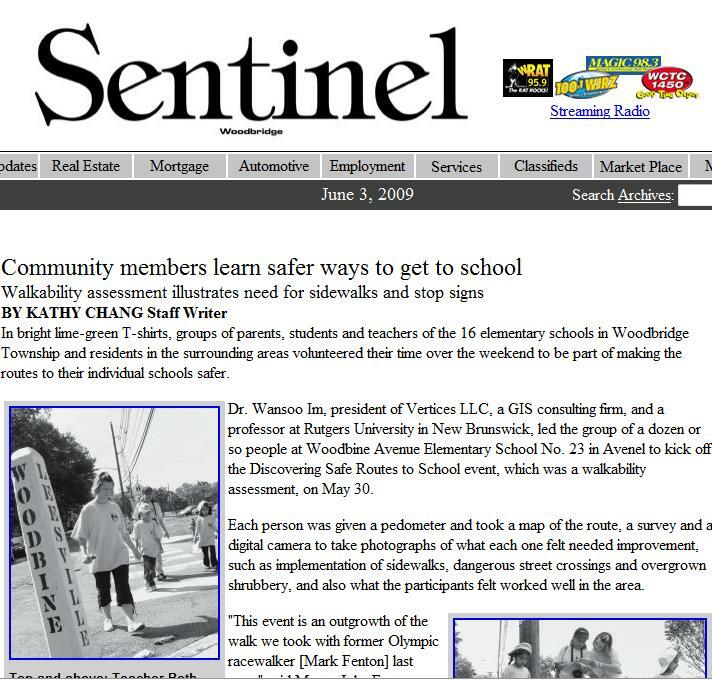 Please meet at your local Woodbridge elementary school by 9 A.M. so that the day’s events can begin promptly. The event should last for about an hour and a half. We will be assessing the safety of sidewalks and intersections around each of the school sites. On the day of the event, please bring a digital camera with a removable memory card so that pictures taken during the walkability audit can be immediately uploaded by Vertices staff. For any questions or concerns, please e-mail Bridget M.
We are very excited to announce that we have 100% participation from the elementary schools in Woodbridge! We thank them for their hard work, and dedication to the walkability of Woodbridge! On May 30th parents, students, and volunteers will meet at local elementary schools throughout the Woodbridge area to perform the audit. The event will start at 9:00 am and will last about an hour and a half. Once they are finished mapping their street sections, participants will load photos onto a computer which will later be added to Woodbridge’s very own interactive mapping site. Each student who participates will have their own log on information to access the site and see the points they captured. We hope you are as excited about the event as we are, we can’t wait to see you there! In order to start the process for this projects, interns at VERTICES, LLC. have put together a map of all the schools located in Woodbridge Township. 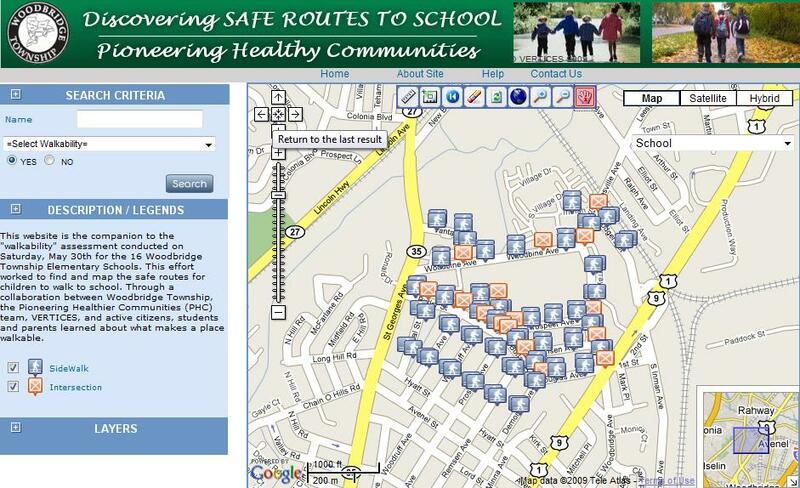 This map will help identify the areas that each school will be responsible for when the project begins. The map will also later be used as a medium to show and organize all the findings collected by the students.